If you’ve signed up for one of our swimrun events you may well be wondering how you go about training for this crazy new sport! To help make sure you are fully prepared and enjoy our events to the full we have put together a 12 week training plan with help from our local coach, Merilin Sikk. Whether you are taking part as a serious racer or just see a swimrun as a fun challenge, it’s really important to be prepared in terms of fitness and mental preparation if you want to get the most out of the experience. Our fitness plan will target your swimming and running speed, help with strength and conditioning as well as encouraging you to get out and train in real swimrun scenarios, giving you a chance to train in your wetsuit, get used to swimming on your trainers and try out your chosen gear. You’ll learn how to train using your heart rate zones we provide links to the furher information you will need. Whilst this swimrun training plan is aimed at beginners to swimrun events, it does assume a good base level of fitness and endurance and that you will have some experience of running off road and swimming in open water – if this is not you then get out there as soon as possible and get working on it! 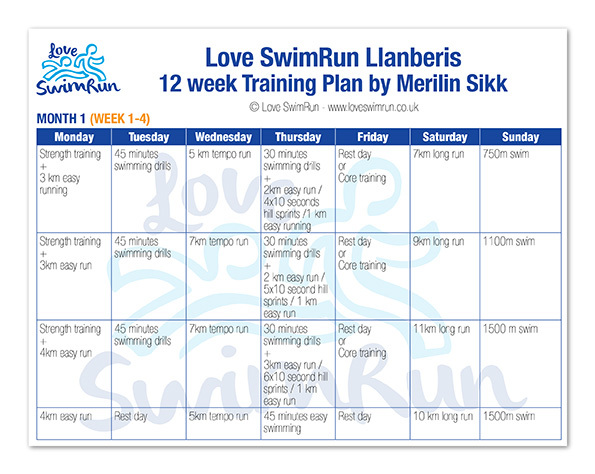 This plan is written specifically for our Love SwimRun Llanberis event which is a sprint distance swimrun of 16km, with a total 12.5km of running and 3.5km of swimming. It is not suitable for longer, more serious swimruns although you could tweak the distances to use this as a base plan for our Love SwimRun Holy Island event which is 18km in total, 15km of running and 3km of swimming. For more specific and personalised training plans, please get in touch with Merilin direct: merilin.sikk@gmail.com, or find her on Facebook here. Staying on track with a training plan for weeks at a time is tough, both physically and mentally, but when you stick with a plan, you not only go into race-day feeling prepared, but you’ll have so much pride and confidence in yourself. To maximize your time training and following this swimrun training plan, it takes shifts in your daily routine, adjustments to your social schedule, a good diet and a lot of self-discipline. A new 12-week plan can be daunting and the end goal can seem a long way off! In order to achieve ultimate success break down targets on your head, and start thinking workout by workout. Having regular feelings of accomplishment by taking it one day at a time will help stimulate your commitment to the plan. If you can train with your swimrun partner all the better, but if you live too far apart or you have entered as a solo try and find a friend to train with for at least some of your sessions. You’re bound to hit mental road blocks, whether you’re tired, the weather is bad, you have to forgo a night out because you need to train in the morning. Whatever it is, you’ll feel stronger with support. A friend will motivate you and mentally help you stay on track. After setting your swimrun training plan start-date, take a look at the weeks leading up to the event and see where there might be conflicts in your schedule. If there are dates where you have commitments, plan well in advance, and find ways to fit both into your schedule. Move your training days around if you have to and give yourself a rest day on that day. Planning like this means you can still have a life and allows you to mentally prepare and stay on track. Committing to a training plan is adding a whole new layer to your every day responsibilities. Recognize that when you commit to training, give and take in other areas of your life are necessary. Share your goal with family and friends and explain why it is important to you to help them (and you!) understand in advance what you need to put on-hold to make yourself successful. Weekends are for long runs, long swims and real swimrun training. That means during these 12 weeks of training, your social life might take a back seat so you can eat healthy and get plenty of rest. Every training plan has key workouts and if you miss them week-after-week, you simply won’t be successful. If you skip your long runs. swims and swimrun sessions, you’re going to see set backs in your plan. Or, it could result in injury if you try and pick-up where you left off. These key workouts need to be done in order to prepare your body physically for race-day. Give these workouts priority each week and build your training around them, giving them your best effort. Swimrun transition training (link) is a must for becoming comfortable and slick with your gear. Give yourself rewards for reaching your weekly or daily goals – buy a new bit of kit for the event or have a sneaky slice of cake! Print this plan off and pin it to a wall then tick off each day as you go so you can actually see your progress. Give yourself a good pat on the back when you do well but, just as important don’t beat yourself up if you have to miss a session or don’t feel you are as fast/strong as you should be. We all have bad days – just make sure tomorrow is a good one!